Oops, my nails are on fire! Yay. I'm very happy to present you a gorgeous polish. This is Nfu Oh 45. This polish is also a polish I brought back from Seoul. 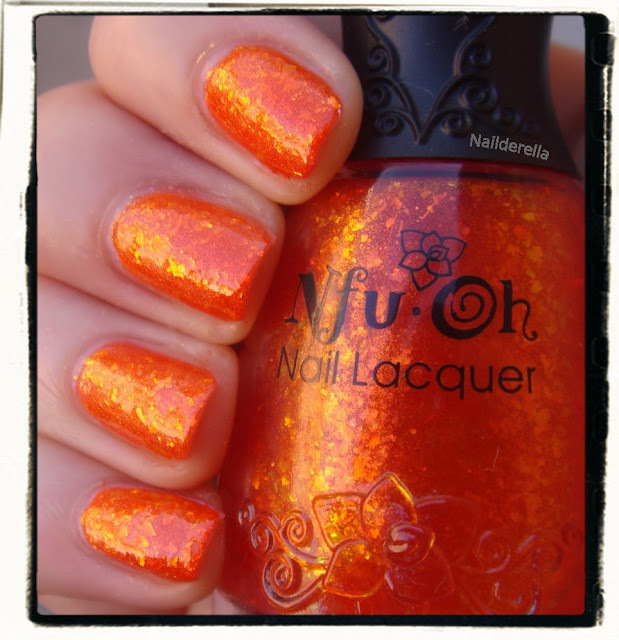 As you probably know, Nfu Oh is a very famous Korean brand that has some gorgeous holo and flakies polishes! If you want to see my Nfu Oh haul, click here and there for my post about the Nfu Oh headquarter in Seoul. 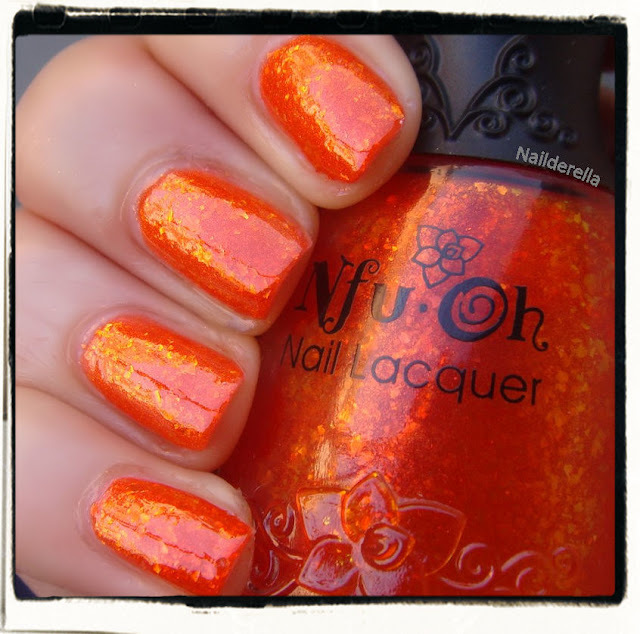 Nfu Oh 45 is part of the Shiny Opal collection. This means it has lots of gorgeous and beloved flakies. It's a deep, rich and vibrant orange jelly with red undertones. The surface is very smooth. The flakies flash orange and also some yellow. This is polish is super bright and vibrant. It's very shiny and sparkles a lot. Final verdict: OMG! This polish is amazing. It's not for the shies! 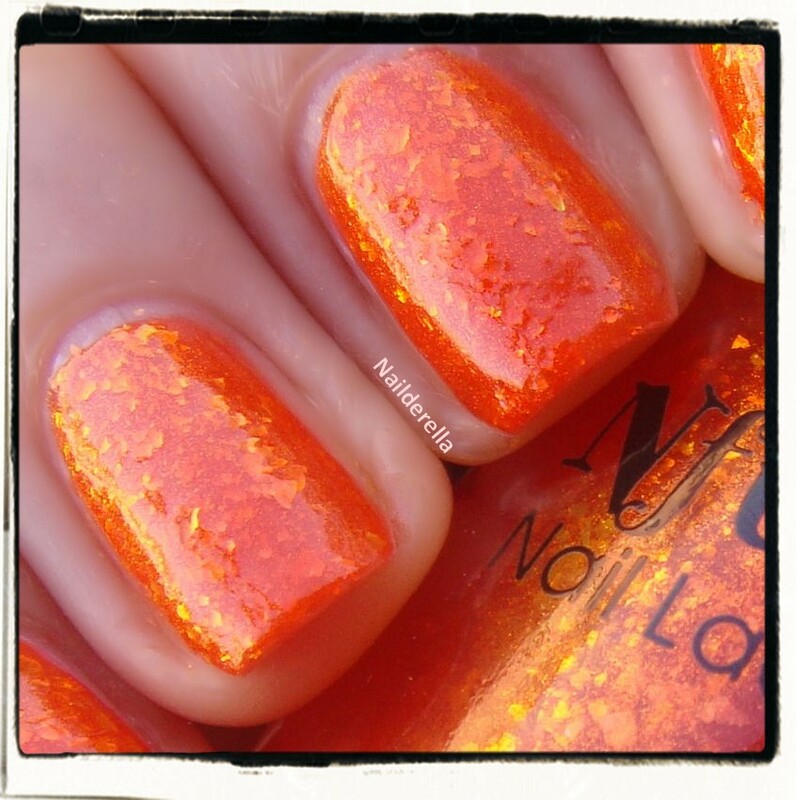 It's such a bright and vibrant orange jelly packed with gorgeous flakies. It has literally set my nails on fire. It's rather sheer. So I layered it over a light pink (OPI Pandamium Pink). I tried also to layer it over a red polish and it made Nfu Oh 45 look redder. It brings its red side out (cf close up picture). I used 3 coats of Nfu Oh 45 because I think it gives more depth to the flakies...like a 3D pattern. That is one gorgeous polish, LOVE it! You're killing me with all your Nfu Oh posts! Gorgeous!!!! OMG! I LOVE the tile of this post! Awesome polish! Wow, this is an amazing color! You have an eye for color. 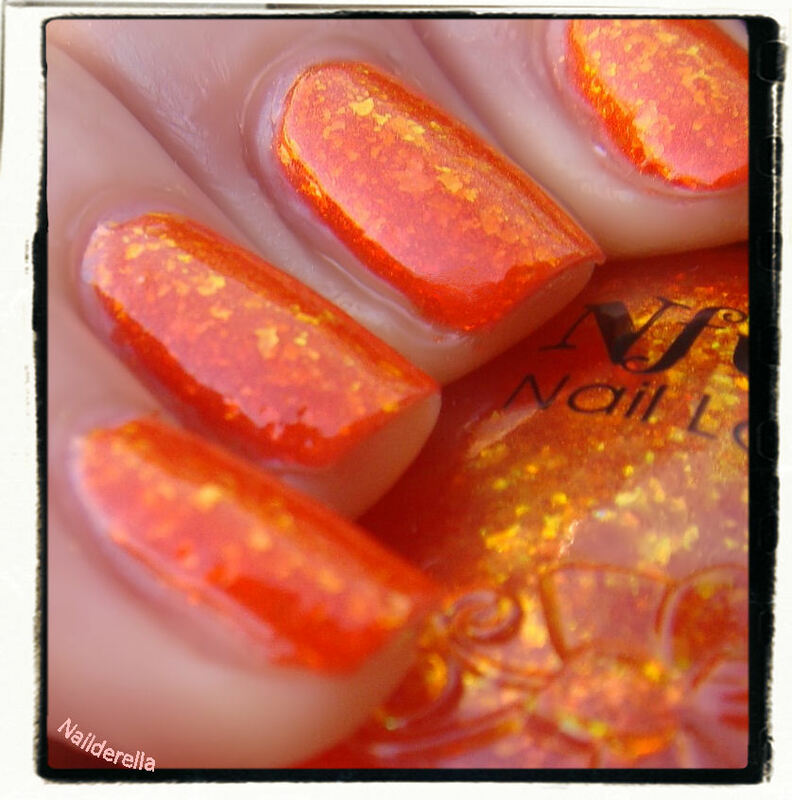 I need to buy some Nubar polishes asap. This one is going on my list too! This is gorgeous! Daresay I like it even more than my beloved Nfu Oh 54?! Gorgeous, I love the different shades the flakies gives it! These Nfu-oh flakies are just super!! Wish I could won them all!! Looks stunning, I love nfu oh I just had 44 on and didn't wanna take it off! Love it. They do give off the illusion they are on fire! That is one LOUD mani! Does it glow in the dark and keep you awake! Goshh this is beautiful ! Orange doesn't suit me, but I'd wear this for sure, looks like real LAVA! 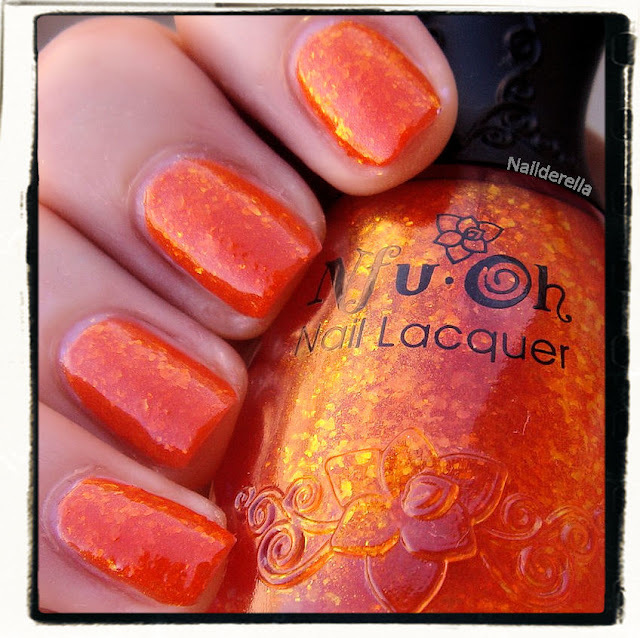 OMG I would loooove to have this polish!! Sooo gorgeous. This one is going on my wish list asap. Over Pandamonium Pink? Wow good call! I never would have thought, you're brilliant :) I love it. They ARE on fire! Thank you for joining my New Beauty Blogger Link Party with such an awesome post!